This finishing technique can be used in many applications such as wood floors, decks, docks, concrete floors, outdoor wood furniture, wood counter tops and many other porous surfaces. Hundreds of people have used this method successfully over the years since we first reintroduced Pure Tung Oil back into the spotlight. You will find other websites that have shamelessly copied all or parts of this information to call their own. What most of them lack is the technical experience to guide you though the process. We are here to provide you with our full support to the best of our ability and make only the best materials available. The biggest key to application of a finish is preparation. The surface should be free of oil, dirt, grease and any other contaminates. Tung oil can not be applied over another type of finish. It can only be applied to a previous coat of oil. For best results a previously finished floor should be chemically stripped of its finish, cleaned with TSP, then lightly sanded to open up the surface. If the surface is not clean or has recently been stripped of its finish; it should be cleaned with TSP. TSP (Trisodium phosphate) is a powdered heavy duty cleaner that will leave the surface free of contaminates. If you have a wood surface, which is old, and case hardened, it should be scuff sanded lightly with 150-grit sandpaper, to open up the wood to receive the oil. Sanding with too fine sandpaper will case harder the surface. If after removing finish you find black or brown stains, see Oxalic Acid wood bleach to remove them. Following is the technique, which I found to work well, although there are many others who may have variations which work just as well. All coats of oil should be cut 1 to 1 with thinner. Thinner can be mineral spirits (paint thinner), citrus solvent (all natural thinner), odorless mineral spirits or turpentine. I prefer not to use Naphtha, as it seems to dry too fast. If the surface seems to be very hard and non-absorbent, you can thin the oil down even more. 1 to 1 is the ratio that is a good starting point which I found works best for the first coat. But if you have a very dense hardwood you may need a thinner ratio. Do a test spot to see if the Pure Tung oil / Solvent mix soaks into the wood. Adjust the ratio so it will soak in the 40 minute time frame. So lets right here make a rule to remember “The 40 minute Rule”. If the ratio you are using does not absorb in 40 minutes add more thinner. Your can use a brush, paint roller, finish pad or apply the oil with a sponge mop wrapped with old nylon stockings. The nylon stops the mop from tearing upon the floor. On floors, start at one corner and work your way to the other side with a liberal application of the one to one mix. If the room is fairly large you will notice most of the oil soaked in where you started. Go back to the beginning and apply another coat. Continue to apply the oil from beginning to end in this fashion. You will do this until you have a uniform glossy surface for 20 to 40 minutes. If the room is not large, you should wait 20 to 40 minutes between applications. The Pure Tung Oil should stand on the surface for 20 to 40 minutes and stay glossy over 80% of the surface without really dry spots appearing. The really dry spots can be individually coated. You may have to apply 3 to 7 coats of oil one on top of the other until it stays glossy. After all coats are applied and you waited 20 to 40 minutes you are now ready to wipe down the surface. Wipe all excess oil from the surface with lint free “T-shirt” type material. Hang rags out side to dry. Allow floor to dry over night. For the second application on the following day, mix a ratio of 1 part Pure Tung Oil to 1 part thinner. If the wood floor is very dense and non absorbent you may find a thinner ratio is required. Possibly 1 part Pure Tung Oil to 2 parts thinner. If it is an old floor and absorbing a lot of oil on the second day, a 2 part oil to 1 part thinner will work better. The objective is to get as much oil into the wood without letting it build up on the surface. The ratio of thinner to oil can be varied, use your own judgment. Multiple THINNER COATS are always better than a few thick coats. Tung Oil works by oxidation with the air and polymerizes. So you want to get as much oil in the floor as soon as possible, but you do not want to apply it with out thinning. It takes too long to dry and will sit on the surface and dry leaving a frosted appearance. Pure dry tung oil left on surfaces will also scuff leaving white marks like dry skin. So always thin Pure Tung Oil in floor applications and wipe off the excess. Using the 1 part Pure Tung Oil to 1 part thinner, apply the same way as the first application with a brush or sponge mop. Apply the oil in several coats one after another till you get a uniformly glossy surface that stays glossy for 20 to 40 minutes. After the waiting period, wipe the oil off the surface with a “T-shirt” type material. When wiping you do not need to scrub the surface. Just gently and evenly wipe excess oil from the surface. At this point the floor should dry for 7 to 10 days before you can walk on it with soiled shoes. You can walk on it at any time during the drying process as long as your shoes are clean. You will want to keep some T-shirt material on hand. During the next week you will want to buff up any seepage that rises to the top during the drying process. You can do this by laying the T-shirt material on the floor then stand on it and shuffle your feet around on top of the T-shirt material. This will polish and buff the floor slightly. You may also consider putting down wax paper to walk on the floor. Do not use cardboard, newspaper, paper or plastic. Wax paper will allow the floor to breath and dry. Wax paper rolls can be purchased from the local dollar store. If you speak to the manager you can probably get a deal on a case. If you absolutely must move furniture onto the floor before it is dry, nail plastic furniture glides to the bottom of the feet. With these on the bottom of the feet and the end grain of your wood furniture legs will not absorb the oil from the floor and leave a mark. The Pure Tung Oil finish will take 15 to 30 days to fully cure depending on temperature and number of applications. Buffing the finish to a low sheen cannot be achieved before the finish is cured. Waxing over Pure Tung Oil should not be done until the finish is hard and cured. The wax will only sink in and have no effect. The Tung Oil will dry to a matte flat finish and look as though there is almost no finish at all. You will find however that water spills bead like a waxed car on the surface and do not absorb. In high traffic areas such as doorways you may want to do a maintenance coat once a year. Use thinned down oil 1 1/2 parts Citrus Solvent to 1 Part Pure Tung Oil with a clean T-shirt or bed sheet material, apply a thin coat over night or for the weekend if possible. Tung will provide a deep rich color to wood floors. It does not however, provide a gloss or even semi-gloss finish. To make a semi gloss surface you would need to wax the surface or buff when the floor is dry. Any type of oil base finish can go over Pure Tung Oil at a later date. To clean your hardwood floors with oil after the finish is cured a mild detergent such as “Ivory Dish Soap” or “Simple Green” will work. I am not fond of Murphy’s oil soap as it seems to break down a finish over time. Stay away from harsh oil base cleaners and ammonia. You can use a “Scotch Bright” pad to clean tough spots every so often but try to avoid abrasion unless necessary. To clean black heel marks or paint splatter, “Goof Off” or “Oops” work well. These products will not effect the cured finish. If you find you do scrub the finish too hard somewhere, just do a quick touch up with a 2 parts Citrus Solvent to 1 part Pure Tung Oil. Lightly dampen a clean cloth and apply real thin. allow to dry over night. In the years down the road if you need to add a maintenance coat, I recommend using 2 parts Citrus Solvent to 1 parts Pure tung Oil for that as well. Just rub on real thin with clean cloth or bed sheet material. If some worn area’s soak up the oil mix add more to those area’s . Here is a way to calculate how much Pure Tung Oil and Citrus Solvent you may need to finish the floor. This formula will assume you are cutting the oil one to one with solvent. Each gallon of oil will cover approximately 400 square feet undiluted. By diluting the oil one to one with solvent, it will cover 800 square feet. In our example we will assume you have 500 square feet to cover. This means you would need 3.125 gallons of Pure Tung Oil and 3.125 Gallons of Citrus Solvent. You could just round up to 4 Gallons of each. Old materials will absorb much more oil then a new floor Old materials may benefit from using a straight up 100% Pure coat of oil on the first coat. Follow by thinned coats for the remainder. Very dense hardwood species such a Brazilian cherry would need to use a 1 1/2 parts Citrus Solvent to one Part Pure Tung Oil for all coats. Pro Tip: When doing future maintenance on your oiled floor and you need to get it done fast. Put a 2 part Citrus Solvent and 1 part Pure Tung Oil into a spray bottle. Mist on the floor in the worn areas, then buff with a high speed buffer and a dense natural blend buffing pad. Do the worn area’s first then do the rest of the floor overlapping the worn area’s again just like you have not done them at all. So the worn area’s will get two coats. 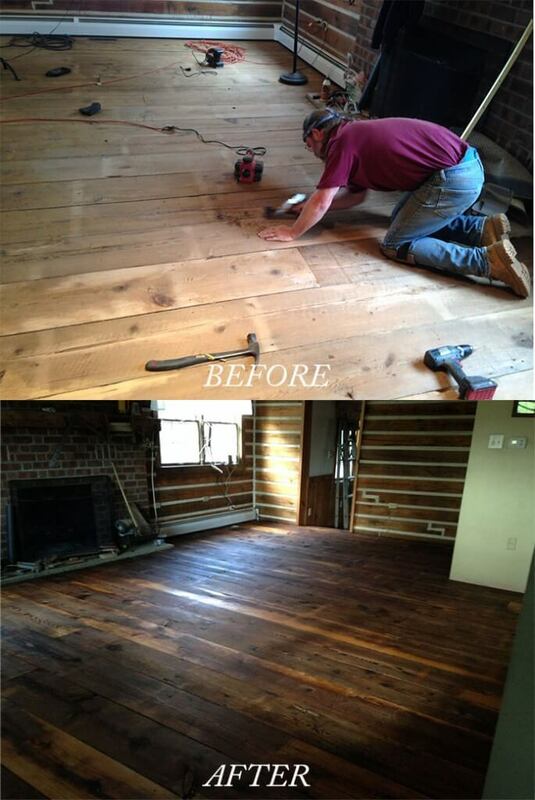 Before/After photo detail of a wood floor finished with 100% Pure Tung Oil. Great product and great guidance to use on your website. I finished this room but took this photo halfway to show the effects. The Real Milk Paint Co.